The radiology faculty and staff at UPMC are dedicated to providing an unparalleled academic and clinical experience in a supportive environment for all our trainees. It is our goal to provide a solid foundation and an ongoing resource our graduates will draw from throughout their medical careers. Our long-standing commitment to the education of medical students, residents and fellows has led to the establishment our newly accredited Interventional Radiology-Integrated Residency Program. The UPMC IR-IRP has been carefully crafted to provide our residents with superlative training in both diagnostic and interventional radiology in a friendly and cooperative environment. The Accreditation Council for Graduate Medical Education has accredited the UPMC IR-IRP for 10 positions. The IR-IRP is an advanced program beginning with the PGY-2 year. An internship year is required prior to entering the IR Residency Program. We prefer a surgical Internship for an optimal clinical foundation entering the residency. 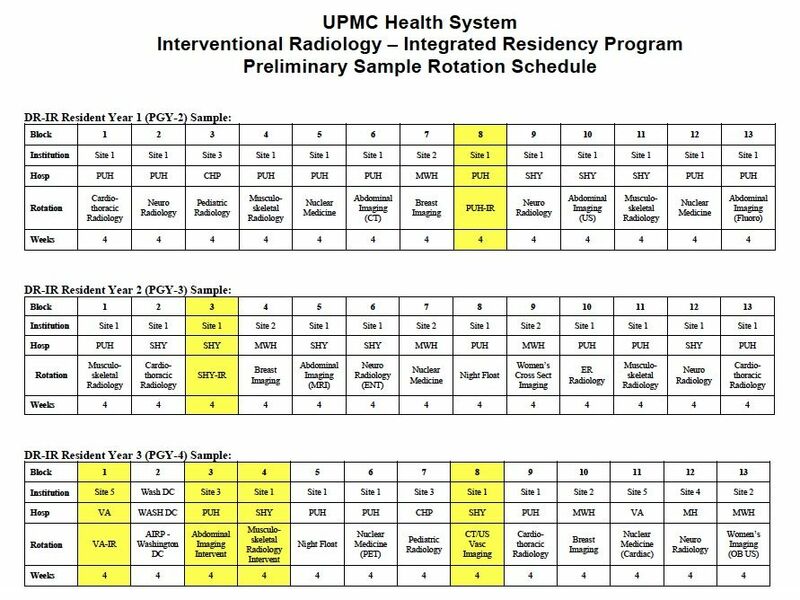 As per ACGME requirements, the first three years are designed to provide a solid core education in the fundamentals of diagnostic radiology and radiation physics rotating side by side with residents in the long-established UPMC DR residency. The large and experienced academic faculty ensures superb training in the fundamentals of diagnostic radiology while multiple training sites provide broad clinical experience in a collegial, comfortable, state-of-the-art facilities. Clinical training is supplemented with a minimum of 10 hours of dedicated weekly educational conferences. The senior residents will spend their fourth and fifth years rotating though the various interventional radiology rotations, clinics, ICU and other elective rotations including vascular surgery. Training focuses on excellence in clinical care, research, and teaching while fostering the individual interests and talents of residents. The various radiology divisions regularly provide services across institutional/hospital lines throughout UPMC to assure uniform excellence of clinical care and teaching. Residents spend the majority of their training at the two flagship institutions of the UPMC Health system - UPMC Presbyterian and UPMC Shadyside Hospitals. UPMC Presbyterian is the core academic Level I trauma center. With 792 licensed beds, the institution is ranked among the nation’s top hospitals by US News & World Report, and provides innovative, high-quality care to patients from the local community, western Pennsylvania, and throughout the world. UPMC Presbyterian has completed a major physical renovation of virtually the entire radiology department. This has led to a new state-of-the-art radiology facility with brand new equipment throughout. This includes 5 angiographic suites, new dedicated sub-specialty reading rooms, and patient consultation areas. Included in the $50M renovation is a state-of-the-art conference room with the ability to live stream multi-disciplinary interactive conferences to our other educational sites as well as secure log in from personal computers, tablets and smartphones. A dedicated resident lounge with full radiology work stations, computers, the radiology library, and individual locker rooms are shared with the DR residents. All residents also have full access to a variety of medical resources through the Health Sciences Library System serving the University of Pittsburgh and UPMC. UPMC Shadyside Hospitals delivers patient-centered, innovative care through its 502 licensed beds and the attached Hillman Cancer Center. UPMC Shadyside provides high-quality comprehensive cardiac care in cardiology, geriatrics, vascular medicine and endocrinology and has received top rankings from the Society of Thoracic Surgeons. The Hillman Cancer Center, part of UPMC Shadyside, is the flagship treatment and research facility of the UPMC Cancer Center network and a nationally recognized leader in oncologic diagnosis, treatment, and prevention. Hillman is also home to the Interventional Radiology Oncology Clinic. Magee-Women’s Hospital of UPMC (MWH) is a nationally recognized leader in women’s health. MWH maintains 383 licensed beds and is ranked in the top ten nationally for gynecologic care by US News & World Report. With over 10,000 deliveries per year, MWH is the busiest birthing center in the region and also one of the state's busiest mammography centers. It offers a complementary and distinct clinical experience when compared with the core institution due to the different inherent patient population. Previously a full-service women's hospital, MWH has expanded to include a full range of medical and surgical services for women and men including programs for the diagnosis and treatment malignancies, digestive disorders, orthopedic care, minimally invasive abdominal surgery, and vascular surgery. Rotation though MWH provides trainees with experience in many procedures not commonly performed at other UPMC training sites. Residents actively participate (with direct supervision from interventional radiology attending physicians) in multi-disciplinary outpatient clinics dedicated to the evaluation and treatment of uterine fibroids and other pelvic pathology and the Magee-Women’s Hospital Vein Center where they learn methodology for minimally invasive treatment of venous disease. UPMC Mercy provides exceptional health care to neighborhoods based in the center of the city of Pittsburgh. UPMC Mercy maintains 495 licensed beds, and operates the only combined Level I trauma and burn center in western Pennsylvania, providing care for the most severely injured patients. The busy Interventional Radiology service at UPMC Mercy performs more than 2500 body interventional procedures/year and is staffed on a daily basis by full-time Fellowship-trained Interventional Radiology attendings. Unlike UPMC Presbyterian and Shadyside, IR Residents perform a full range of CT- and US-guided body interventional procedures at Mercy in addition to all other conventional fluoroscopic-guided procedures helping to round out trainee experience. The UPMC Mercy IR suites are in the final stages of a major renovation project with a brand new angiographic suite, dedicated procedural area and dedicate IR reading rooms. Children’s Hospital of Pittsburgh of UPMC (CHP) is the regional resource for comprehensive pediatric care. CHP is one of 10 pediatric hospitals in the United States named to the US News & World Report Honor Roll of American’s “Best Children’s Hospitals” for 2016-2017 with nationally ranking in each of the 10 pediatric specialties listed in the honor roll. The hospital maintains 304 licensed beds and was the first pediatric hospital in the country to receive the HIMSS Stage 7 HER designation for implementing an electronic medical records system that keeps patients’ medical information updated and available throughout the UPMC network. 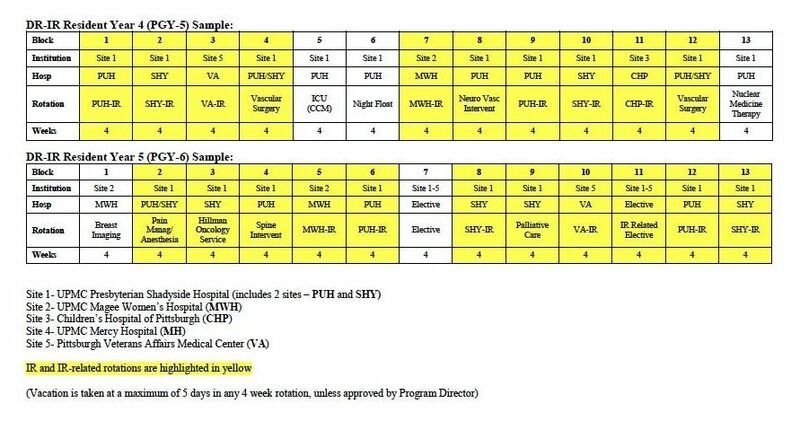 Radiology residents spend no less than 12 weeks at CHP during their first three years of training and have the option for additional time up to 2 months in the R4-5 years for experience in pediatric intervention. Four fellowship-trained pediatric interventional radiologists staff the IR section with a busy service encompassing a full range of pediatric interventional procedures. Interventional Radiology residents will gain experience in the performance and interpretation of all aspects of vascular and nonvascular intervention such as image guided biopsy and drainage, hepatobiliary and genitourinary intervention, vascular intervention and diagnosis (CTA/MRA) in peripheral vascular disease, trauma and general medicine, treatment of GI bleeding and portal hypertension, and a wide variety of vascular access techniques. CHP is one of the largest pediatric transplantation centers in the world. In addition, the pediatric IR vascular malformation clinic is the largest in the region with more than 360 patients evaluated and treated yearly. IR residents will see patients in the Vascular Anomalies Clinic and follow them through their sclerotherapy procedures and inpatient stay. This institution serves as the sole site for training in pediatric imaging and includes training in all diagnostic-imaging modalities. 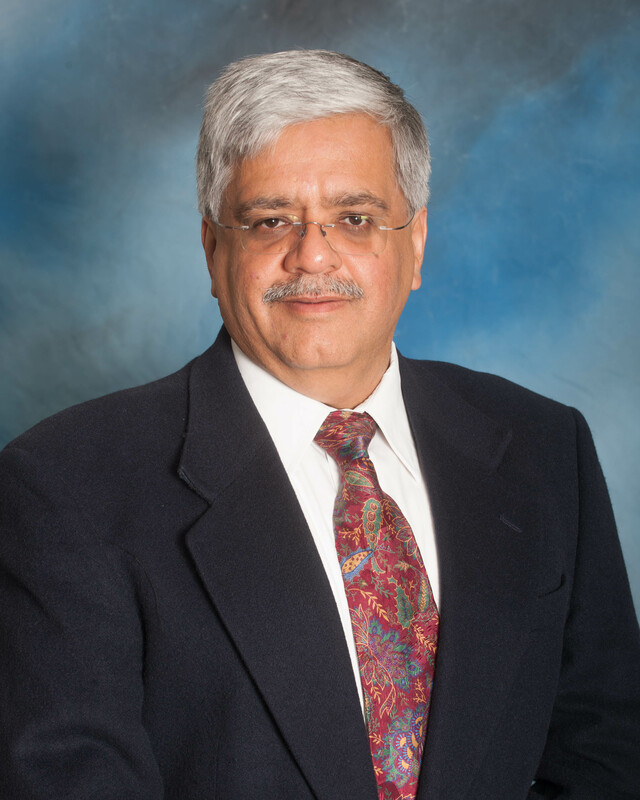 All diagnostic radiologists at CHP are fellowship trained in pediatric imaging. The University Drive Veterans Affairs Medical Center is a 357-bed medical/surgical tertiary care facility located 1/4 mile from UPMC Presbyterian Hospital. The Medical Center is a national and regional referral center for liver and renal transplantation, cardiac surgery, oncology, radiation therapy, and geriatric care. Active ongoing research programs are present in multiple subspecialties including diagnostic radiology and interventional radiology and these contribute significantly to the clinical and academic atmosphere of the Medical Center. Residents will spend 8–16 weeks at the VA medical center with rotations in general radiology, nuclear medicine, and interventional radiology. These rotations provides excellent experience and exposure to community and tertiary care of veterans including the diagnosis and treatment of peripheral vascular diseases. All residents also participate in the four-week course in radiologic-pathologic correlation at the ACR/AIRP in Washington, D.C. This curriculum complies with the ACGME requirements. Radiology residency positions nationwide consistently excellent candidates, and our diagnostic radiology residents compare favorably with those from any other program in the country. Quantifiable measures of our diagnostic radiology residents’ performance include written and oral American Board of Radiology examinations and the annual American College of Radiology (ACR) Diagnostic Radiology In-service Examination and we expect the same for the IR Residents. Over the past decade, the mean performance of University of Pittsburgh diagnostic radiology residents on these standardized examinations has been consistently excellent. Our unparalleled caseload and diverse patient mix allows us to easily meet all newly instituted ACGME requirements for both Diagnostic Radiology and Interventional Radiology-Integrated Residency Programs. Our department is currently ranked 17th in the nation in NIH grant funding for radiology departments allowing ample opportunities for academic research. Accordingly, the Radiology Residency Program is well represented at multiple major radiology meetings yearly by residents' scientific presentations and exhibits including of the three largest national radiology meetings – the Radiological Society of North America (RSNA), the American Roentgen Ray Society (ARRS), and the Society of Interventional Radiology (SIR) as well as other subspecialty conferences throughout the U.S. Many of our residents have also participated in publications in peer-reviewed journals including Radiology, the American Journal of Roentgenology, and the Journal of Vascular & Interventional Radiology. The University of Pittsburgh, Department of Radiology is committed to training the finest radiologists in the country. All department graduates will be well prepared for eventual careers in community or academic medicine. Applications may be submitted through the ERAS. The UPMC IR Fellowship participates in the National Residency Match Program. © 2016~2019 | Department of Radiology This beautiful artwork is created by Stephen Kyu.